Habitat: Grasslands and savannahs; do not like closed forest or thick brush. Predators: Humans; young may be vulnerable to lions. Feature Facts: C.s. simum went from 20 individuals left in 1895 to 11,640 in 2002. The number had increased to 20,405 by 2013. C. s. cottoni decreased from 2,230 in 1960 to about 30 individuals in 2002, representing a 98.7% decline. This number had further declined to only 3 as of 2015 November 22. 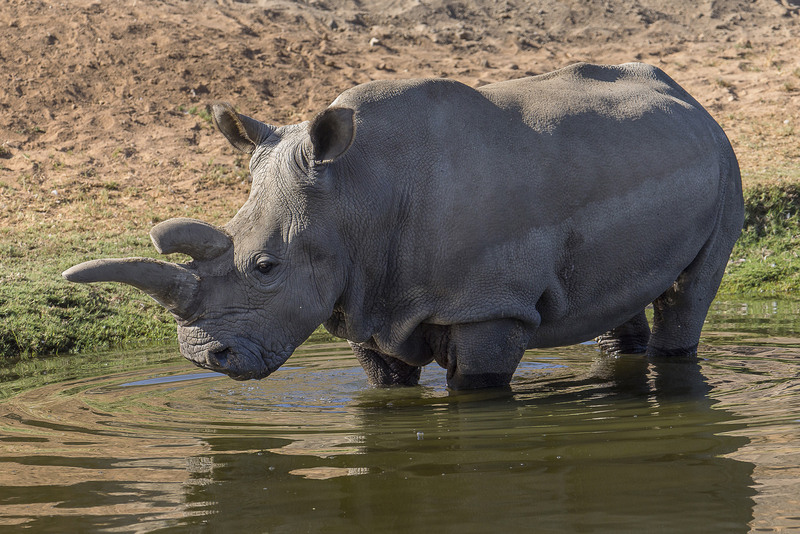 Although C. s. simum is considered a conservation success story, rhinos are still heavily hunted for their horns, and therefore must be carefully managed in the wild. Society Press: San Diego Zoological Society was the last zoo in the world to have C. s. cottoni in its collections. Nola, a 41 year old female, passed away 2105 November 22. The remaining three northern white rhinos are two females and a male at Kenya's Ol Pejeta Conservancy. 94 southern white rhinos (C. s. simum) have been born at the Wild Animal Park between 1971 and 2015. © 2015-2019 San Diego Zoo Global. Minor updates in 2013, 2015. Population updates Mar 2018, Apr 2019. How to cite: White Rhinoceros (Ceratotherium simum) Fact Sheet. c2015-2019. San Diego (CA): San Diego Zoo Global; [accessed YYYY Mmm dd]. http://ielc.libguides.com/sdzg/factsheets/ whiterhino.